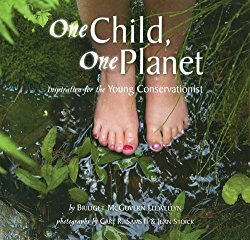 This book gives ideas of ways a person can help take care of the earth and why it is important to do so. It mentions greenhouse gasses in a way thats as kid-friendly as possible when they explain how they help keep the earth’s climate right and what happens when there is climate change. It gives you ways on how to be less wasteful and be considerate of how go about our daily routines. It talks about the importance of trees, conservation, and why it is important to Reduce, Reuse, Recycle. I like that the book has beautiful photographs of earth and the beauty that lies within. It is written in a way that is very easy for a parent or teacher to explain to a child why its important to be kind to the earth; and simple enough for a child to understand. The photos are clear and the language is engaging. One part of the book mentions why it is important to save water while you brush your teeth or take bath, as we can save it for the fishes. Kids can connect water conservation to themselves because people need water to clean and drink. Kids can make a connection to the world, that fishes live in water; and that water is important to the fishes because they live in it. I love the list at the end of the book that gives suggestions on what a child can do for the earth. My favorite amongst the dozen listed is a suggestion for when a grandparent asks you what you want for you birthday, to ask for a tree and then planting it special! How neat is that idea? Saving this for my girls are a little older. We love trees in our house. Our girls are all named after trees (and believe it or not, my husband and my name also has a tree connection). All in all, this is a great resource to have at home to celebrate Earth Day, everyday or have in the classroom if you are doing a unit on “Going Green” or want an inspiring and thought provoking read-aloud for Earth Day.